About a week ago, we all heard the horrifying news about the Charleston shooting. If you don’t know the details, Google it. I’m not a news reporter…merely a thinker and feeler like you. Hearts were broken. Lives were torn apart. What has been done can never be undone. A ripple has once again been set into motion that will have long reaching impact beyond the scope of what you and I will ever really know or understand. Because Charleston in and of itself is but a mere ripple in the ongoing saga of the global, timeless story of hate and injustice. It started with Cain and Abel…brother against brother. And who knows if and when it will ever end. Racism? Yes. Hate crime? Absolutely. By product of a systemic evil? I believe so. Political fodder? Sadly, it is. Aren’t we all aware that hate exists in the world? Don’t we know it’s been here since the origin or the species? Don’t we fully expect it to always exist in this world? Don’t we “get” that politics and new laws and tearing down of old relics will accomplish nothing? Dr King knew something very important: you can’t politicize love. He never called for forced legalization of acceptance. He did not seek for “love” of fellow humankind to be accomplished politically, but rather socially and spiritually. In my opinion, it seems, ironically enough, that the south has handled Charleston better than the northern cities of Ferguson & Baltimore handled their sad & troubling situations. 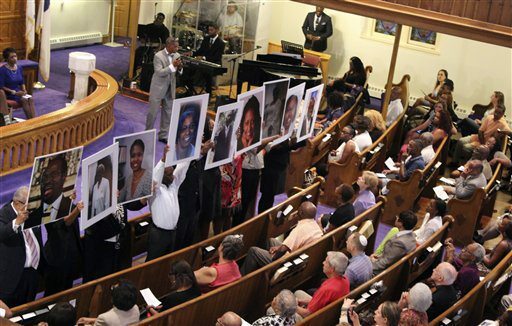 Rather than riots, looting, and hate mongering, many citizens of Charleston bonded together across racial lines, and held a vigil an inter-racial prayer vigil and memorial for the victims who lost their lives on the evening of June 17, 2015 in the mass shooting. In the midst of great crisis, the people of the community came together, unified by grief, despair, sorrow….and yes, love. Black & White people southerners came together united, choosing not to be divided. For all the knocks the south has taken toward racism, it appears that the south has faired better than their northern counterparts on a communal level. Does racism still exist in the south? Sure. But doesn’t it exist everywhere? Name a town in any country; any city in the world, and we will find hate existing somewhere in that community. So what do we do about racism, and sexism, and religious divide? I’m not sure that’s the right question. I think the right question is this: What are YOU going to do about it in your heart and mind. What will you pass down to the future generation growing up in your own household? How will you be an agent of loving change in the community where you live? Many will choose political argument, lobbying, loud voices and raised fists. But I believe there to be a better way. And I believe “that way” will have greater and longer lasting impact in the longest run. How do you know if you're a leader? There's only one way to know. If people are genuinely following you, then you are a leader. John Maxwell once said, "He that thinkers he leadeth, yet no one followeth, that one merely taketh a walk." And it's so true. I see a lot of people on social media attempting to fake leadership, acting as if people are following them. This tactic never works. This is not a knock on those people, because I understand what they are desiring: they want to lead. And it's a great aspiration for one to want to become a leader. But faking leadership isn't the answer. If you want to become truly a great leader of others, you must first lead yourself to greatness. It's the only way. When people witness you doing a great thing, they will follow you in that endeavor. So, Network Marketing leader: if you want people to follow you, learn how to become the top recruiter in your group. Life Coach: if you want a book of amazing clients, make sure that you personally are living a great life in wholeness. Sales Person: if you want to lead a great sales team, be #1 on the boards every month. Pastor: if you want a fuller crowd on Sundays, be the #1 soul winner in your congregation. Financial Coach: really hard to teach people to get debt free if YOU aren't debt free! Health Coach: potential clients take one look at you and ask the question, "Do I wanna look like him or her?" People will follow you when you've done great things, and they believe that you can help them to accomplish the same feats. Leadership is influence. Nothing more, nothing less. And influence cannot be taken! It must be willfully given. Instead of faking being "leader", a better play would be to simply go do something great. People will then follow you. Trust me. We really don't have the right to complain about our situation until we're willing take responsibility and do something about it. You know you're capable of more. The question is: What are you gonna do about it? 🎯UPDATE on NATE 1️⃣ Measured my Body Fat this morning: 18.7% - Not great, but not as bad as I thought. BMI sitting at 25 2️⃣ I'm committed to run 1,000 Miles in 2019. 8 down, 992 to go 👍🏻 3️⃣ I'm not very public with it, so you probably don't know this yet, but Robin & I have re-entered the Home Business arena, and have already put together a team getting close to 100 people in a very short time. If you followed us in the past, you know this will grow into the 1,000s. 4️⃣ Our "Read the Bible with Me" group is going to Israel in November, and we are PUMPED!! Would you like to go? There are limited spots for the trip, so if you're interested...reach out right away. 5️⃣ Today we start taking down the Christmas decorations. I'm sad 💔 6️⃣ So far in crushing my Daily Habits for 2019! That means I WILL achieve my goals!! And that sets my soul on 🔥 7️⃣ Being Intentional toward Goals requires FOCUS! As such, I spend less and less time with my phone. Technology should be wielded as a sword and leveraged to our advantage, rather than keeping us constantly on "auto-respond" and controlling our attention. 8️⃣ God is my #1. In a world that grows more and more godless and is more concerned with humans being their own god and living life according to their own agendas, I am more and more aware of how imperfect I am and how absolutely perfect my God is! His plan is supreme, and it's the only path I want to follow. I'm doing my very best trough prayer, meditation and staying in His Word to walk HIS path...not mine.